Sheldon Fox was an early promoter of the Cedar Falls Mills Company. He came to the community in the 1850s and helped build the first mill on East 2nd Street. In addition to his milling interests, he also financed long- term loans following the Civil War, when such loans were difficult to obtain locally. Fox built this house in 1863 at the age of 43. The date is inscribed in stone above the front door. 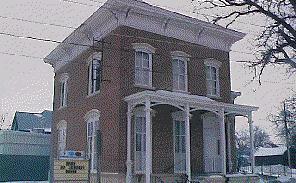 It was built in the Italianate style, though later modifications have altered its original appearance considerably. The porch has been removed, as has the belvedere that once sat atop the Tuscan roof. Inside, the rooms retain their 14-foot ceilings. The wall between two bedrooms has been removed to make a meeting hall for the present owners, the I.O.O.F. The kitchen area has also been drastically remodeled; and the open, winding front stairway has been replaced. The Fox House knew tragedy as well as prosperity. Fox's widow, Amy Burr Fox, died at age 96 in 1916 during a violent epidemic. Her daughters Mary and Ella died on the same day of the same illness.